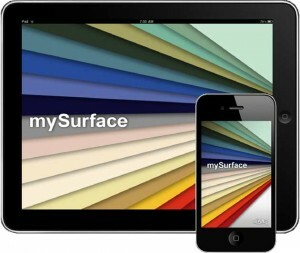 New mySurface iPad app for design featuring DuPont™ Corian® and DuPont™ Zodiaq® colors « Beverin Solid Surface, Inc. The free application provides high-definition, full-screen, zoomable product sample images of over 100 Corian® and Zodiaq® surfaces. The new version of the mySurface application offers a new design interface optimized for the iPad and includes a fresh selection of kitchen, bath and commercial photos in the design gallery. Also, users can try out the sharing tools for posting colors and images to Facebook and Twitter right from the application. DuPont is committed to providing the latest technology and innovative solutions to our customers in order to make their lives easier,” said Thomas F. Schuler, vice president and general manager — DuPont Building Innovations. “We are proud to be the first in the industry to launch a tool like mySurface, and we will continue to position DuPont at the forefront of technology and design.